Tornados are devastating and have the power to completely destroy anything in their path. In addition, homes well outside the direct path of the tornado can incur significant damage from the severe storm that generates the tornado. While there’s no way to mitigate damage if a tornado passes directly over your home, it’s still worthwhile to learn some of the most common ways a tornado can damage your property so you can better prepare before the next tornado warning is issued in your area. Like the big bad wolf on steroids, tornados are sometimes powerful enough to lift the roof right off of buildings. Contrary to what you might think, this isn’t done by sheer force from the outside, but by low pressure that builds up on the inside. When the combined interior low pressure and exterior high pressure surpasses the force exerted downward by the roof, it lifts up and is swept away in the wind. You might think the solution is to open windows and doors during a tornado warning to equalize the pressure. However, it really comes down to having a strong roof, since even in homes where the windows have been shattered, the roof has still lifted off and blown away. Plus, you’re safer inside your home – and also minimize damage from rain and flying debris – if you keep the windows closed. The solution instead is to attach the roof more securely to the home. As of 1995, new homes in hurricane zones must be built with the roof strapped to the walls and foundation to help protect against high winds. You can employ this same tactic for protection from tornadoes. The pressure difference between the inside and outside of a home in a tornado can also cause the windows and patio doors to shatter in their frames. The glass simply can’t withstand the force being exerted on it. This type of tornado damage can occur miles away from the tornado itself. Even if the pressure doesn’t shatter your windows and sliding doors, flying debris in a tornado definitely can. Closing impact-resistant shutters over the outside of your windows and doors once a tornado warning is issued helps prevent the glass from shattering. In addition to minimizing damage to the windows themselves, this can help compartmentalize your building and maintain more barriers between you and the storm. Because of its large size and relatively lightweight construction, your garage door is among the most vulnerable areas of your home in a tornado. Even high winds miles away from the actual tornado can be enough to knock the door off its track. Don’t wait until a tornado warning is issued to reinforce your garage door; unlike slow-moving hurricanes that give homeowners time to install temporary vertical braces, fast-forming tornados require you to prepare ahead of time. Strong winds, flying debris and hail can wreak havoc on your siding. Paint can chip or discolor, vinyl siding can crack or dent, stucco can have holes punched in it, and trim around brick walls can suffer significant damage. Of course, in extreme cases, tornadoes can hurl large objects such as cars, telephone poles and mail boxes right through the wall of your home. You can’t protect against the most extreme damage to your home’s siding, but it’s possible to mitigate milder harm caused by a tornado. The first tip is to remove dead trees and branches from your property that could become projectiles in windy conditions. Then, inspect and repair loose siding, gutters, brickwork and other building components to make sure they’re secure. The bottom line is if a tornado warning is issued for your area, you should hunker down in the basement, cellar or tornado shelter as quickly as possible. 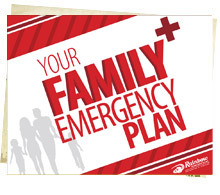 Saving you and your family members’ lives is more important than preserving your home. For more tips to protect your home before the next tornado warning, or to schedule cleanup services following a natural disaster, please contact Rainbow International®. We’re here to help restore your home and get your life back on track.